Judging from this week’s UGCB tasting of 2015 Bordeaux in New York, the vintage is very good, although lacking the sheer wow factor of 2009 or 2005. I see it as a modern take on classic tradition, by which I mean that the wines tend towards elegance and freshness, but without the heavy tannins or herbaceousness of the past, and are relatively approachable. After a day tasting around 100 chateaux, I had a 1978 Léoville Lascases for dinner: the difference in style is most marked in the delicious tang of herbaceousness marking the 1978. Needless to say, there was not a trace of herbaceousness in any of the wines of 2015. I miss it. 2015 is a relatively homogeneous vintage: there is more or less even success across the board. It is even true that the difference between modernist and more traditional châteaux is much less marked than in some past vintages. In previous vintages the modernists–among which I include Pape-Clément, Smith Haut Lafitte, Lascombes, Lagrange, Léoville-Poyferré, Pichon Baron, Cos d’Estournel–have stood out for forward fruits, very ripe and round, sometimes approaching New World in style: in 2015, modernism takes the form of a smooth sheen to the palate, with tannins tamed and very fine. But it’s a general mark of the vintage that tannins are rarely really obtrusive, and the taming of the tannins is likely to mean that, unless it closes up unexpectedly, the vintage will be ready to start relatively soon,. Appellation character is clear this year. Margaux is very fine and elegant, although there is a tendency for the lighter fruits of the appellation to let the tannins show more obviously than in other appellations. The appellation generally gives somewhat the impression of a lighter year. Durfort Vivens has really revived, with a fine effort that speaks to Margaux, Kirwan has more finesse due to its new cellar, Lascombes is more elegant and less modern than usual, Rauzan-Ségla is quintessential Margaux, and Siran presents a great view of Margaux from the class of Cru Bourgeois. The same sense of elegance carries to St. Julien, except that here the tannins universally seem exceptionally fine in the background, making many wines more immediately attractive; St. Julien is closer in style to Margaux than to neighboring Pauillac. Beychevelle as a very convincing expression of the appellation, Gruaud Larose is very much on form this year, Lagrange seems lighter compared to its usual modern style, Léoville Barton is stylish and elegant, the quintessential St. Julien, while Léoville Poyferré is distinctly more modern. Moving into Pauillac, there is more power in the background, with wines somewhat rounder, but there’s a range from almost rustic to utterly sophisticated. Tannins are held in check by density of fruits, making wines seem relatively approachable. A fine effort from d’Armailhac is almost plush, it’s a good year for Grand Puy Ducasse but it doesn’t have the breed of Grand Puy Lacoste, which is structured and built to last, Lynch Bages is a solid representation of the appellation, Pichon Baron shows the smoothness of its modern style, but this year Pichon Lalande gives an even more modern impression and seems quite approachable. It’s always hard to get a bead on S. Estèphe at the UGCB because so few châteaux are represented, and the top châteaux are missing, but if I got any sense that the vintage was less successful in any one appellation, it would be here. Tannins are well in front of fruits and less tamed than in other appellations: the classic tightness of St. Estèphe tends to show through. None of the wines can be called generous, although Lafon-Rochet gets half way to Pauillac with a smooth palate, Cos Labory shows the tightness of St. Estèphe, and Phélan Ségur seems on the light side for the appellation. Outside of the great communes, La Lagune will be a classic, La Tour Carnet is more modern but not as obvious than usual, Cantemerle is quite smooth. Cru Bourgeois show in similar style to the grand cru classés, but with less refinement and roundness; there isn’t the difference between the classic approach and the luxury wine approach of rich years such as 2009, although the advantage of the grand cru classés remains obvious. Graves has many lovely restaurant wines, that is, well balanced for drinking immediately. In Pessac-Léognan, I did not get much sense of the classic cigar-box in the reds, but the wines did seem a little more granular than the Médoc. Domaine de Chevalier is lovely with its usual crystalline brilliance, Haut Bailly is more granular, Larrivet-Haut Brion is smooth, Malartic-Lagravière is just a touch more tannic, Pape-Clément is not quite as modern in its aromatics as Smith Haut Lafitte. It’s a very good year in St. Emilion, with wines showing the generosity of the right bank, but nicely restrained rather than lush. In fact, restrained is the phrase that occurs most often in my tasting notes. Beauséjour-Bécot is smooth, Canon is beautifully refined, Canon La Gaffelière is a top result for the appellation with layers of flavor, La Gaffelière is true to the structured tradition of the château. Making its first appearance at the UGCB, Valandraud no longer makes the outrageous impression of a garage wine, but seems in the mainstream. Pomerol does not show full force lushness, and is only a little more fruit-forward than St. Emilion, with many wines showing more obvious evidence of structure than usual. The restrained black fruits of Clinet tend to elegance, even Michel Rolland’s Bon Pasteur shows evident structure. Whites are decent but nothing really stood out for me: Graves produced lovely restaurant wines in whites as in red. Pessac-Léognan seems less concentrated than usual, and wines tend to be soft and attractive. Particular successes: Châteaux de France, Malartic-Lagravière, Pape-Clément, Smith Haut Lafittte. Sauternes are delicious, with Château de Fargues as a standout. A sense of purity makes the wines refreshing. Overall a very good year, with wines tending to be restrained rather than obvious, most needing only a few years before starting, and probably best enjoyed in the decade after that. I went to this year’s tasting of the Union of Grand Cru Bordeaux in the slightly surreal surroundings of Miami. Outside people were playing in the pool; inside we were tasting the first showing in the States of the 2014 vintage. Ten or twenty years ago, if I had said this was a restaurant year, it would have been taken as meaning that the wines were relatively light and enjoyable to drink in the mid term without having the potential to age longer term. That is a reasonable description of Bordeaux in 2014 except for a big difference: most of the wines are virtually ready to drink now because of the refinement of the tannins; in the past they would still have needed several years to come around. Few of the 2014 vintage need more than another year or so, and even for those it’s more a matter of preference than a necessity. Because the wines do not have punishing levels of extract, and the wines are more restrained than usual, this is a great year for seeing the differences between appellations. Typicities are especially clear on the Left Bank, although the restrained style of the vintage makes the Right Bank seem less rich and powerful than usual. This is not a great year for whites, although there is more variety in the character of Pessac-Léognan than usual, from Domaine de Chevalier’s usual crystalline precision, to Smith Haut Lafite’s crisp Sauvignon edge to a rich palate, and Pape Clément’s exotic opulence. Most others show a tendency to display Sauvignon Blanc’s herbaceous side, sometimes with an exotic overlay. The relatively light character of the vintage shows through in Pessac-Léognan, where the wines tend to elegant black fruits rather than power. They are well balanced for current drinking; some give the impression that it may be important to enjoy before dilution begins to set in. The extremes of precision versus breadth show as usual in Domaine de Chevalier (one of the few that really does need some time) and Pape Clément (less international than usual). Haut Bailly is definitely top flight Left Bank, but seems more Médocian this year. It’s a relatively crisp vintage in the Graves, some might even say tending towards mineral. I think Malartic-Lagravière have upped their game in recent years, and the 2014 is a very good representation of the vintage in Pessac: sweet ripe black fruits show a smooth palate with refined tannins in the background, and just a faint hint of herbal impressions. The characteristic velvety core with a sense of lightness of being that marks the Margaux appellation is evident in this vintage. The difference from the more direct structure of St. Julien is clear. Marquis de Terme, Kirwan and Prieuré-Lichine show the velvet, Durfort Vivens and Rauzan-Ségla capture the elegance of Margaux, and Lascombes seems less international than usual. With light, refined tannins, most are almost ready to drink now, will be fully ready in a couple of years, and should improve over a few years. Margaux is more homogeneous than usual in this vintage. St. Julien shows its usual elegant structure. As so often for me, Léoville Barton is the benchmark of the appellation: elegant palate, refined structure, complexity underneath. Langoa Barton is not so complex; Léoville Poyferré shows signs of its more international style in a faintly chocolaty finish to a smooth palate, as does Lagrange. Chateau Gloria is ironically the quintessence of a grand cru with a very fine sense of structure, while St. Pierre is less subtle and more forceful. Gruaud Larose has that typically tight impression of youth; Beychevelle as always is dryly elegant. Most need another couple of years and should be good for more or less a decade. Moving from St. Julien to Pauillac, there’s an immediate sense of smooth black fruits, an overlay that is quite velvety and rich. Chateau d’Armailhac is the quintessence of Pauillac this year, with that characteristic plushness of the appellation. As always, Grand Puy Lacoste shows the refined side of Pauillac, with the vintage expressing itself by a slightly overt touch of structure at the end. Lynch Bages is a bit on the tight side, but the structure is just protected by the fruits and should support longevity. St. Estèphe is always hard to judge at the UGCB because so few chateaux are represented, but my general impression is that the typical hardness of the appellation shows rather obviously on the palate. Yet the approachability of Ormes de Pez is a vivid demonstration of the change in style of Bordeaux over the past twenty years. Listrac-Moulis and the Haut Médoc generally make a more traditional impression than the great communes, perhaps showing more resemblance to the Cru Bourgeois than to the grand crus. Sometimes the bare bones of the structure shows past the fruits. Showing the lightness of the year, Chasse-Spleen is quite classic, Cantemerle flirts with traditional herbaceousness, La Lagune is a bit fuller than its neighbors in Margaux, and La Tour Carnet shows the 2014 version of the international style. The one word that describes this vintage in St. Emilion is unusual in the context of the appellation: restrained. The wines show their usual flavor spectrum, but are toned down from their customary exuberance. Canon and Canon la Gaffelière show great purity of fruits, Beauséjour Bécot is a marker for the appellation in this vintage, Clos Fourtet and La Gaffelière are attractive but without a great deal of complexity. Pomerol also merits an unusual description: elegant. Most wines display their usual flavor spectrum, without enough stuffing for longevity, but with the restrained nature of the vintage letting purity of fruits show through. Perhaps the succulence of Beauregard is the most Pomerol-ish, Bon Pasteur is the most elegant, and Clinet, La Pointe, and La Cabanne really represent the character of Pomerol in this vintage with a balance between softness and freshness. This is not a great vintage for Sauternes. Even so, “I’ve stopped spitting,” announced my companion, the Anima Figure, when we reached Sauternes. The wines are sweet and citric, a little honeyed and piquant, but mostly without the intensity of botrytis. Chateau de Fargues stood out for me for its higher level of botrytis and classic balance. While this is a lesser vintage, there are some lovely wines, with the style representing a move back to classicism in its freshness, yet staying in the modern idiom by its approachability. There is much less difference in approachability than usual between the Left and Right Banks: St Emilion and Pomerol are absolutely ready, and the Left Bank is virtually ready. If nothing stood out as superlative, none failed to represent their appellation. They will give a taste of the authentic Bordeaux for the next few years. This has been a whirlwind week, with visits to 20 chateaux. My next book, the Wines of Modern France, profiles the 500 leading producers, including about 100 from Bordeaux, of whom 40 are on the right bank. Trends on the right bank are a bit different from developments on the left bank, and the most disturbing is how clearly the old family estates feel themselves threatened. He was also at the forefront of the move to expand into the Côtes de Castillon where Château d’Aiguilhe is one of the most successful properties. 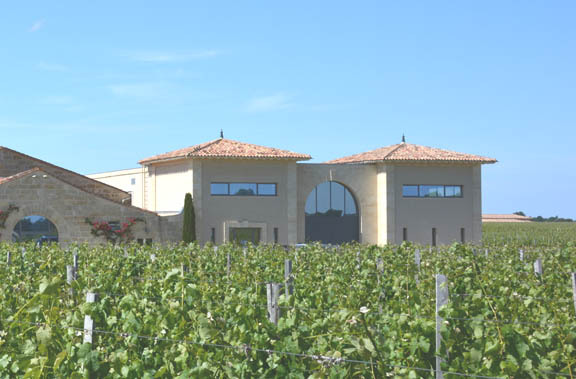 “No one knew about Castillon 20 years ago, we were the first to invest in 1995… I can grow in Castillon, here in St. Emilion I would have to buy my neighbors. In another 10 or 15 years it will be possible for Castillon to make wine of quality similar to the best areas of St. Emilion.” But he concedes that quality is variable now. “The problem is that they can only survive by quantity.” With a powerful common identifying mark for his chateaux of the coat of arms, Stephan has expanded his way out of the threat to family businesses. On to Beauséjour-Bécot, a small property right on the top of the limestone plateau which is the best terroir in St. Emilion. Juliette Bécot is very much conscious of the recent change in atmosphere: “We are a family estate, it’s belonged to my family since the Revolution, we earn money only from viticulture, but we have to compete with owners who can invest lots of money from other sources.” Unable to expand in St. Emilion, Juliet bought another estate in Castillon from which Joanin Bécot comes. Tuesday: expansion in Pomerol. Hard to know whether to regard Chateau Clinet as an old family property or new money, as it was bought by Ronan Laborde’s father in 1999 to satisfy Ronan’s interest in winemaking. There’s been a program of investment in both vineyards and chai, with Merlot increased to 90% by a mixture of plantings and acquisition of a new all-Merlot vineyard. Chateau Clinet is the major part of production. This is an operation in plain expansion. “Fleur de Clinet is not strictly a second wine, it has some declassified lots from Clinet but is mostly juice and berries purchased from other growers in Pomerol. In addition, Ronan is a Bordeaux AOC blended from five different appellations, which will shortly be moved to a new facility just near by. Thursday: ten generations in St. Emilion. After lunch we meet Alexandre Malet Roquefort, who now manages Chateau Gaffelière together with his father. I explain that I remember drinking my way through a case of La Gaffelière 1971 in the late seventies; this was my introduction to right bank wines. In due course Alexandre’s father, Comte Malet Roquefort, appears to say that he wants to meet someone who’s been drinking La Gaffelière for almost fifty years. Aged 81, the Comte is a veritable tribute to the benefits of red wine. La Gaffelière’s reputation was suffering a few years back, but now there seems to be constructive engagement between modernism and tradition. The facility is workmanlike: “we didn’t want to impress visitors, it’s not Disneyland here,” says Alexandre. “The DNA of La Gaffelière is classic wine, it’s one of a small group in St. Emilion that didn’t change its style in recent years. We like a wine that is fruity and not too extracted.” Perhaps that’s why I still like it. From one family property to another, we moved over to La Conseillante in Pomerol, owned by the Nicolas family since 1871 (they are not related to the Nicolas wine shops). The vineyards have been the same 12 ha for three centuries, but here the facility has been completely modernized. Actually a third of the vineyards are in St. Emilion, running into Cheval Blanc, which you can see from the windows of the tasting room. As a result, “La Conseillante is not entirely typical of Pomerol; if Pomerol is known for power and richness, we are known for elegance and silky tannins,” says winemaker Jean-Michel Laporte. I realize that the right bank wines I like most are all exceptions to the most common styles of their appellations. Today I visited three Premier Grand Cru Classés in St. Emilion: Chateaux Angelus, Beauséjour Bécot, and Canon la Gaffelière. The feel of the visits could not be more different, the wines all have their own distinct styles, but all three share the fact that they have expanded out of St. Emilion into neighboring areas, the first into Lalande de Pomerol to the west, the other two into Côtes de Castillon, just on the northeast border of St. Emilion. Don’t be put off by the name. Côtes de Quelquechose almost always indicates an appellation of secondary importance to Quelquechose. 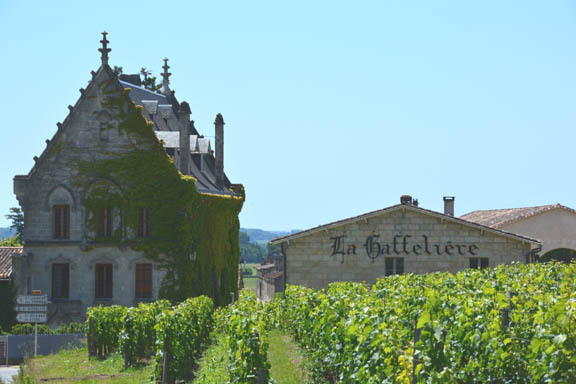 “It would have been much better simply to call the appellation Castillon,” argues Stephan von Neipperg at Chateau Canon La Gaffelière. But the best part of the Côtes de Castillon, at St. Philippe d’Aiguille, has a limestone plateau that isn’t dissimilar to the far more famous limestone plateau where most of the Premier Grand Cru Classés of St. Emilion are located. Granted this doesn’t extend all over Côtes de Castillon—but the famous limestone plateau doesn’t extend over all St. Emilion either. The cost of land in St. Emilion is now prohibitive: proprietors say that it’s but impossible to extend their vineyards. That’s part of the driving force for going out to Côtes de Castillon. Stephan von Neipperg was one of the first. “When I took over Chateau d’Aiguilhe in 1999,” he recollects, “we preserved 27 ha of old vines, and we replaced 15 ha of poor plantings of Cabernet Franc and Cabernet Sauvignon. The problem was economics, people went for quantity, but now they are recognizing the potential of the limestone plateau.” It’s no coincidence that the best wines in Castillon are made by people from St. Emilion: with a keen eye based on their experience in St. Emilion, they have bought vineyards on the best terroir. Juliette Bécot is extremely conscious of running a family estate—“it used to be very common, but now it’s more and more rare” —she says, but felt when she started out that she wanted to have her own voice, so established Joanin Bécot in Castillon in 2001. Now famous for the renovation of Chateau Angelus, with its famous modern bell tower—both God Save the Queen and The Star Spangled Banner were played on the bells when we arrived, as I am British but came from New York—Hubert de Boüard consults for around 60 chateaux as well as running Angelus. He also created Fleur de Boüard, in Lalande de Pomerol, where in addition to the eponymous wine he produces a super-cuvée, Le Plus de Boüard, by selection of the best lots. Even from a single trie in the vineyard, some grapes are selected for Plus rather than Fleur. Plus spends 33 months maturing in oak—longer even than Angelus. The common feature of all these—let’s call them the satellite wines—is that they are made with the same care and attention as the grand vin in St. Emilion, relying on similar expertise, but are available at lower price. Sound familiar? That’s the old argument for second wines. But whereas the second wines are always marked by that feeling that they weren’t good enough to make it into the grand vin, the satellite wines represent the best their terroir can produce. It’s an interesting trade off, that can pay off handsomely when the terroir is right. The satellite wines come from different chateaus from their proprietors’ main chateaus, but show an interesting stylistic relationship with the grand chateaus. Fleur de Bouard is the plushest; Chateau d’Aiguilhes is the most structured (Domaine de l’A, from oenologist Stéphane Derenoncourt, where I have a visit planned for later in the week, shows similar character but is more aggressive), Joanin Becot is the lightest and most approachable. In a blind tasting, they would be difficult to distinguish from St. Emilion at the level of the Grand Cru Classé. Perhaps Fleur de Boüard has more of the richness of Pomerol. These are all very good wines by any measure, and by and large, I prefer them to the second wines from the corresponding chateau in St. Emilion. The only thing these wines can’t compete on with St. Emilion is price.